Today's outfit is one that I've been wearing over and over at home. 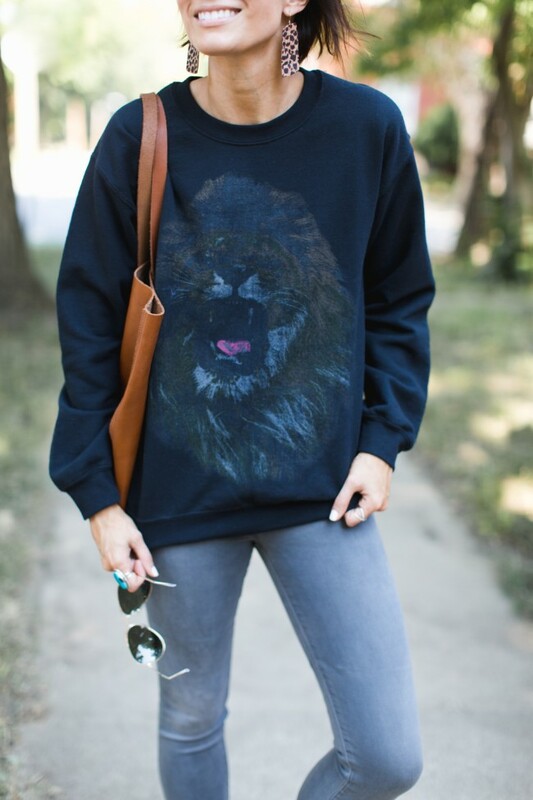 I love sweatshirts (probably even more than sweatpants) and I'm always in one around the house. 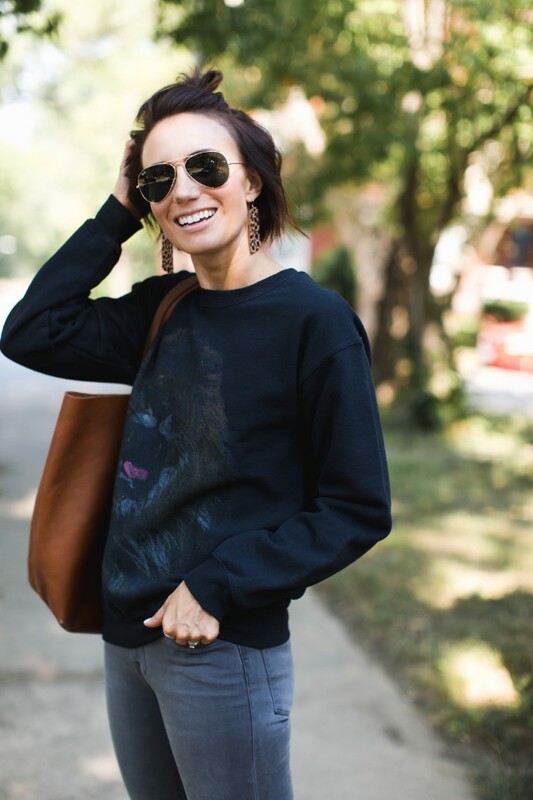 This sweatshirt is a fave and then of course my Nickel & Suede pullovers. I love layering them over a tee, wearing them around my waist or just lounging in them. This one fits TTS and these jeans fit TTS, but I'm wearing a size smaller than normal because of what the store had in stock (a 25 instead of a 26). They fit really well and are a flattering wash (which is hard to find in gray jeans!). And then these wedge sneakers. I have this version and last year's version and I love them both. I do think the taupe color is the most versatile, but either shoe is great. They really are comfy and both fit TTS! Today's post is kind of random, just ten things you may not know about me. I'm always down for reading random facts about people so hopefully these ones are fun. Cheese is probably the one food I could eat for the rest of my life. Not necessarily the fancy kind, but Monterrey Jack, Cheddar, Provolone- really anything that includes melty cheese. Nature documentaries are my jam. I love learning about animals and all the insects, spiders, mammals, fish and more. I forced myself to learn to love NPR while I was in college. I always thought it was boring, but I knew it would make me smarter, so I forced myself to listen to it until I liked it. Now it's my preferred radio station. I love flowers but only if the bouquets are monochromatic. I don't like colors mixed when it comes to florals. I teach 15-16 year old Sunday School every week. It's usually about 13 kids and they keep me on my toes. It's made me a better person for sure though! I can't sleep in- like literally. I can however take 5 or 10 minute naps. All I have to do is fall asleep for a few minutes and I'm recharged. Socks make me so hot. I am normally a really cold person, but if I'm wearing socks I suddenly overheat. The first thing I remember spending money on as a kid was nail polish. Avon had a Spring pastel collection and I bought every color- pink, peach, yellow, green, blue, purple. And obviously each hand had one finger painted in each color. I love to always have a candle burning. It's one of those things that makes me feel fancy. My phone battery is always hovering at 10% or less. I basically own a landline because I am always plugged in. Also, I just received notice that my phone storage is full and I have the biggest Iphone 7 plus storage capacity that exists. Guess it's time to delete a few pics! What food could you eat for the rest of your life? Have you ever filled up a phone entirely?? Do you feel like the wedge sneakers give you a lot of height? I'm 5'10" already so rarely prefer to add any height to my frame, just wondering your opinion. Thank you! I don't notice much of a difference but they are a 2 1/2" wedge heel. My assistant is also 5'10 and she loves them. I've never filled up my phone completely. I stress if I get too close. I could eat sweet potatoes every day! Cheese would be second for sure. Food? Pick only 1? Well when I worked at Dominos I ate pizza for bfast, 2nd bfast, lunch, snack and dinner! No to the phone question. I would have to choose warm chocolate chip cookies if I could only pick one! Yes! I’ve filled up my phone. I just had to delete a bunch of apps because I have over 1000 screenshots!